Well I can’t say that we really travel to the Imperial Valley for its cuisine, but one of us (the one not from this area) has latched on to the special quesadilla as my cause cuisine. Sure, there is always Johnny’s Burritos – which is good, don’t get me (the one not from the area) wrong – but you can’t eat there all the time can you? Besides, I always order the egg sandwich when I go there which seems like the least ordered item on the menu and almost gets me laughed out of the place by my hosts. In the past we tried the special quesadilla at Celia’s Restaurant in El Centro. And this time, the goal was to try the special quesadilla at Camacho’s restaurant in El Centro. 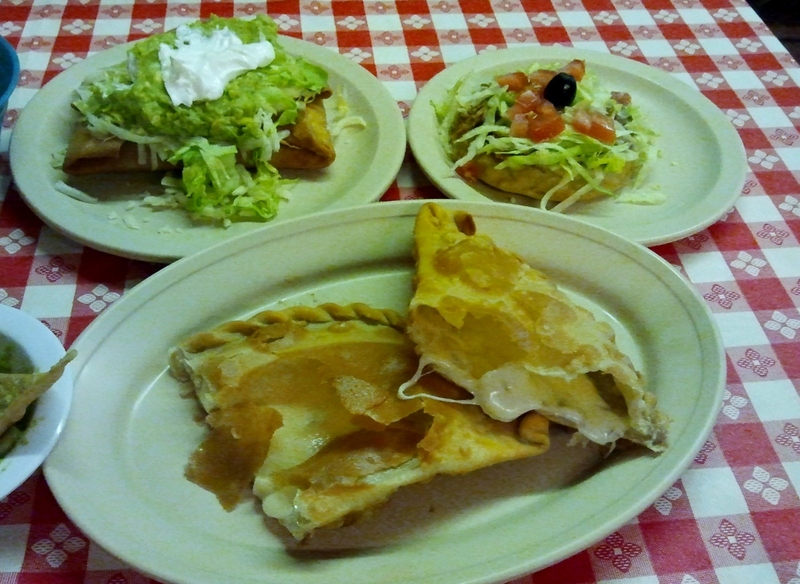 Camacho’s Place is located 796 West Wahl Road, El Centro, California. To quote the commemorative stone slab plaque outside the restaurant: “Camacho’s Place was opened for business on December 12, 1946 by Richard Camacho and his wife, Juanita. It is erected on the site of a former Seventh-Day Adventist church and school that had been damaged and abandoned following a major earthquake on December 31, 1926.” Speaking of earthquakes, just a half mile away on Nichols Road as it crosses over the New River, there is still some road damage from the last earthquake shown below. So on the day we were to leave the Imperial Valley we planned a lunch at Camacho’s Place. Our table of 5 ordered three special quesadillas. The verdict: very tasty and in an original setting. Can’t remember back to the quesadilla we had at Celia’s but we’d guess they are comparable, but the atmosphere in Camacho’s Place has the edge. Just pulling up to the Place surrounded by fields and ditches itself is fun if not a welcome relief from the sun. Oh, and the tortilla chips were fabulous. Judging by the traffic on Camacho’s Facebook page they are a special part of peoples’ lives and it is especially hard on those who have moved away from the area. But, alas, Camacho’s Place ships. Uh oh. Update: May 26, 2012 – Intrepid Imperial Valley Out-and-About Food Critics (D&M) sent this photo of a Special Quesadilla at Camacho’s Place. We also learned that Camacho’s Place has been inducted into the E Clampus Vitus organization.